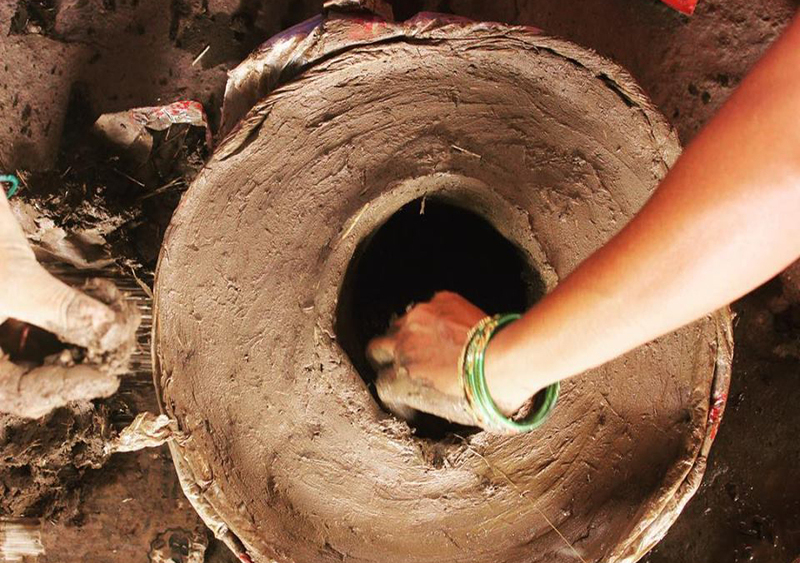 Himalayan Rocket Stove project is like that Rolling Stone which is gathering moss in epic proportions. It’s like a magnet attracting the right and like-minded people as we go along. 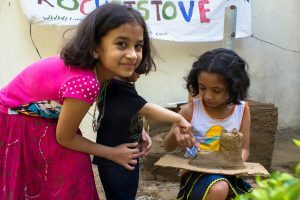 While Russell is so good with providing a detailed update on each activity that has happened, for me…each day gives me an opportunity to talk about this incredible initiative with people from all parts of India and some even outside of India. On any given day, I am talking to people in Ziro Valley, In Rajasthan, Goa, Madhya Pradesh and even in Nepal. It only makes me believe that there are many a Rolling Stones who think much beyond their own daily needs. They think of the environment, they are bothered about the fast-changing climatic conditions, the health of women and children, pollution, melting glaciers and many more issues that binds us all. Whether we acknowledge it or not. 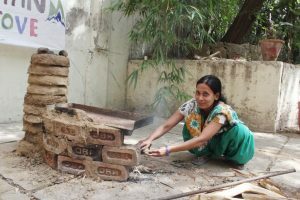 Himalayan Rocket Stove Foundation’s (and I am really overwhelmed that we have taken our first steps towards setting up of this Foundation) Smokeless Chulah initiative provides an opportunity for probably anyone to just make a small difference – or rather volunteer to make a difference and that too without much efforts. And we are also on our way to have a special identity and programme outline for Smokeless Chulah Initiative (Dhuan Hatoa, Zindagi Bachao) This is thanks to another bunch of Rolling Stones at Tailor India led by inimitable & infectiously creative Slogan Murugan aka Mumbai Paused aka Gopal MS. See our FB page for the programme here! 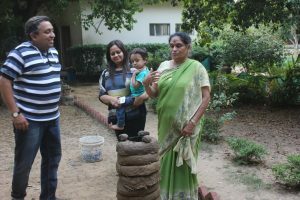 Sidharth, is a childhood friend of mine whose family is very consciously living in sync with nature by practising simple sustainable solutions of organic farming, harvesting the rainwater, tapping the solar power etc. So to explain to him the work we do in our programme was the easiest conversation. By letting us use his backyard for our training programme and having conversations with his staff, it has given our project further wings. 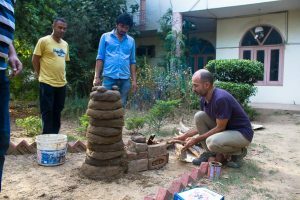 Everyone who was present there, was able to see how effective the Rocket Stove technology is and how easy it is to make these chulhas. And we have a fully converted Sharma family including their super smart and adorable children in spreading the ‘Smokeless Chulah’ mission. In short, we have volunteers and supporters for life. Sidharth’s family is very keen for us to conduct workshops in the communities around their native place in Rajasthan and Uttar Pradesh. And we will soon be collaborating with them to do so. Our trainers made a special baby Rocket Chulah for the kids of the family…and boy! were they happy to get their hands dirty in the clay. But more importantly, they got introduced to the solutions for the global issues like deforestation, climate change, pollution, health risks. Well, that’s how the revolution spreads. So just click on the link below and find your own ways to volunteer with us or simply donate to fund our workshops. I also want to add our Nepal story here. I got a chance to have a few direct conversations with people of Nepal to check the possibilities of conducting our Smokeless Chulah workshops there. The situation in Nepal with pollution levels – both indoor and outdoor is pretty similar to ours. 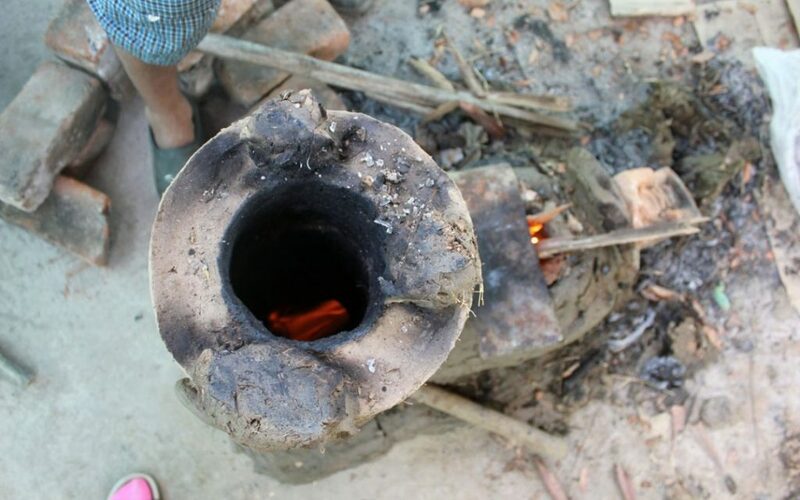 People are very keen to learn new and cheap ways to curb these issues – especially in Rural Nepal where open fire cooking is still the most prominent way.We will soon be putting together a project for Nepal in collaboration with a few organisations and NGOs there to cover maximum grounds and train as many people. We could surely do with a few helping hands there. 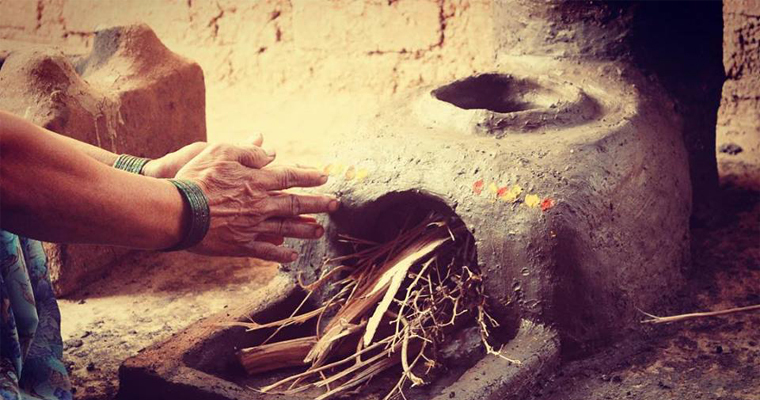 So, look out volunteering opportunities in this beautiful Himalayan Kingdom with Smokeless Chulah Initiative. And finally, an overwhelming thanks to a kickass team in making – Tanzin, Chozang, Kush, Arjun, Ankeet, Neerav, Gopal & Of course, Daddy Russell!